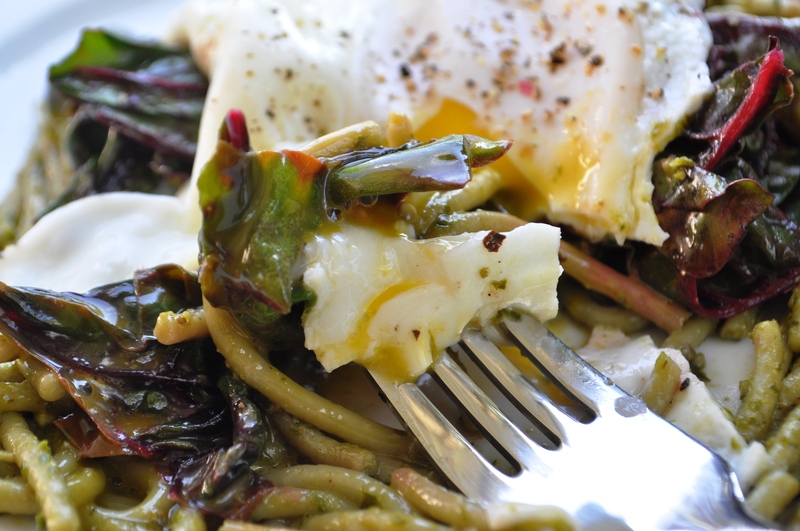 My niece’s man made me poached quail eggs and I ate that … seriously liked it … wonder if my tastes are changing again? I just printed off the zucchini tot recipe on your blog. What a good idea! I can’t wait to try them. I like your yummy looking bird’s nest. 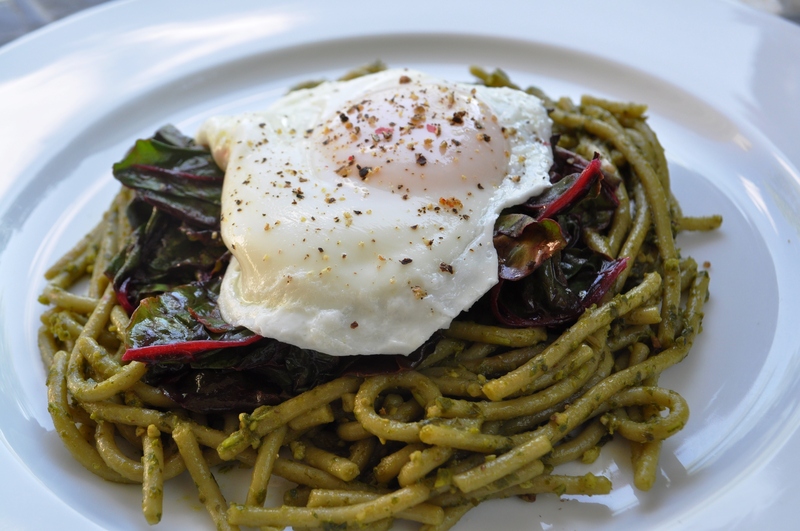 Today I am eating grilled ratatouille with spaghetti but I will look for tinkyada’s gluten free spinach pasta. This nest is such a great idea. 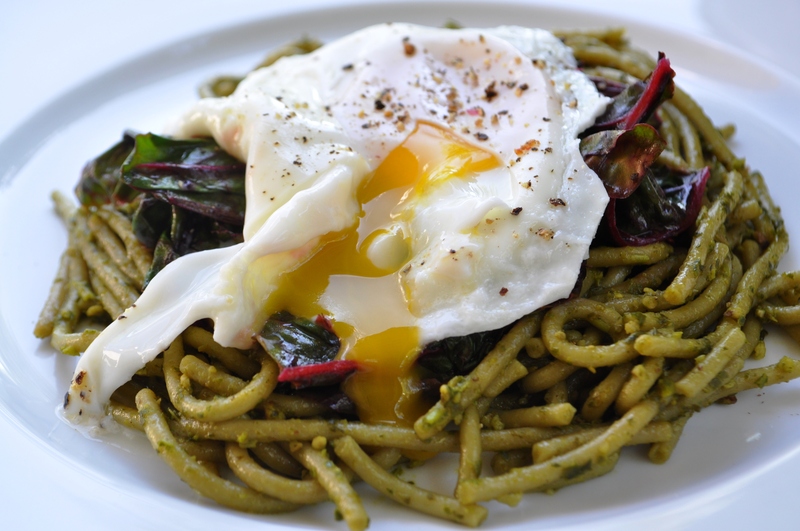 The idea of rich egg yolk mixing with the spinach pasta and chard has me salivating. Well done! One of my favorite surprise discoveries was how great gluten-free pasta tastes. I’m lucky that I don’t have to eat gluten-free, but it’s awesome to be able to switch over some common ingredients with ease, like this pasta. I love your recipe! I know, can you imagine life without pasta! Are you cooking gluten free for someone in your family? It certainly won’t hurt you and the last time I did the research (which was some time ago), I think I found that there are more than 25 gluten free grains. Wheat is just a small blip on our radar. That’s actually the main reason I started this blog…to prove to people that the gluten free and allergen free life really can be enjoyed! No one is gluten-free.. except I read “wheat belly” which troubles me.. it seems wheat is quite modified? That and corn and pretty much anything else that isn’t organic. Sadly, these days, our bodies barely recognize what we put into our bodies as “food”.